Check out this free infographic that shows this process. An Infographic from LOJO's Marketing and Design team. 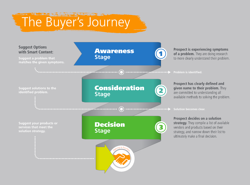 "The buyer’s journey is the process buyers go through to become aware of, evaluate, and purchase a new product or service." We've created this free infographic that depicts this journey and its key steps.